No doubts that leg training is as vital for a bodybuilder as a good nutrition. Do you know why? Yes! Right! A muscle mass. Heavy squats make your body produce more testosterone that really increase muscle growth. Leg workout is exhausting, painful and not everybody can complete it thoroughly. But leg workouts made properly will not only add mass and strength to your lower body but also increase your metabolic rate and overall upper body mass. You can get your best gain working legs only once a week but so hard that you don’t need to train them more frequently. Good advice: drink a little cup of coffee 15 minutes prior to your legs workout. It will stimulate your mental focus as well as increase your endurance. Start your legs workout from the warming up for about 5 minutes. It could be stationary bike ride or jogging, then you can begin. The basic barbell squat is one of the best exercises you can do but it has to be done properly. Turn your toes out about twenty degrees from the position where your feet are parallel to each other. Your knees should always track above your feet. First set is warming up set of 25 reps. Feel every fiber of muscles which you have to prepare for a hard work. Than chose a weight which is a challenge to perform for 8 reps, and somehow do it 12 times. For the next set you have to take a weight you can do 6 reps, and by any means force yourself to complete 10 reps. Keep the form perfect on every repetition. The next exercise is Hack squats. 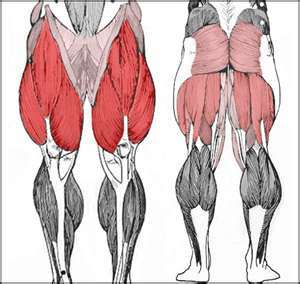 This movement is good for front quadriceps and also brings the details to the quads. Do 2 sets of 12 fully controlled repetitions and go on to another exercise. If you feel it’s not good for your knees you can replace it by the Smith machine squats. The manner you have to set up your feet and move is the same as for barbell squats. The last exercise for your front thighs workout is leg presses. You have to stretch your thighs at the bottom in order to feel not only quadriceps but also hamstrings tension. This exercise works good all of your legs muscles. Don’t forget: slow, controlled movement is the must. Do 2 sets of 15 reps. This exercises affects hamstrings and you should use light weights to avoid an injury. Take a shoulder width grip and do the first warming up set of 25 reps having a good form and keeping your lower back strict. You have to feel your hamstrings rather than your lower back. Then use a weight that allows you to make 15 reps having a good form. Flex your lower back hard, feel a tight stretch in your hamstrings when you move down and squeeze muscles at the top. Do not relax your back and hamstrings at the top position. If you feel that stiff legged deadlift is not comfortable for your knees or lower back, you can slightly bend your knees. 3 sets of 15 reps – and that’s it. I do not recommend to train other bodyparts in the same workout with legs except calves. To gain mass you have to increase your training weights if only for a few pounds every workout or add at least one more rep in each set. Train hard, eat more and grow!